I still remember the day I got my “ticket” to fly, in the form of my pilot’s license. My flight instructor, with a proud yet knowing smile, said, “Your pilot’s license is a ticket to continue to learn, not a validation of your piloting skills.” I’ve spent the last 20+ years and over 1,000 flight hours becoming a pilot and I’ve continued my flight education throughout that time, working with countless flight instructors in order to obtain licenses, ratings, and endorsements. To ensure that I’m the best pilot I can be, I’m continually working on sharpening my skills. Although I’ve worked with a variety of instructors over the years, I’ve always maintained a very close relationship with my original instructor who is affectionately known by my family as our own “Pilot Bill.” Bill isn’t just a talented pilot in practice, he and I have developed a rhythm of communication pre- and post-flight to review my flight plan, my personal minimums checklist, and often to debrief me on my decision-making process after a particularly challenging or stressful flight. Learning to fly, much like operating a business, is a truly dynamic experience. I don’t know if I would have survived my flying adventures without my trusted flying advisor relationship with Bill. As it also turns out, I don’t know many successful organizations that haven’t benefitted from the guidance of a portfolio of trusted advisors. Entrepreneurs, by nature, already have the basic flying skills, but they need the support and wisdom of their trusted advisors to learn the more advanced skills that make them high-impact leaders. Taking risks right out of the gate, either in a plane or in a business, without a trusted advisor providing guidance along the way is an incredibly risky way to operate. As we’ve discussed, trusted outsiders can take the form of a coach, a peer networking group, or an implementer for an operating system. Many entrepreneurs start with a coach and some use them in conjunction with a peer network group or to help implement their operating system. The best approach for you depends on your unique set of hurdles and current business priorities. Think of your coach as your leadership support system. A coach helps you shape your approach to the organization and the people in it and provides the wisdom and guidance to effectively resolve issues and overcome challenges. Your coach gives you the buffer to stay focused on leading the organization. Working with a coach requires some readiness on your part. Are you open to asking frank questions of yourself? Will you experiment with new approaches to working with your colleagues and staff? Are you willing to be held accountable to your goals? Erica asked me to help her find a female coach who had a background in science or technology product development. I recommended Cindy Morgan, former vice president of organizational development and learning at NYU Langone Medical Center and now Vice President, Learning & Organization Development, Penn Medicine (University of Pennsylvania Health System). Cindy didn’t have the specific industry background Erica was seeking, but she fit several other criteria and was in a related field. Erica gathered more names from her network and eventually interviewed over seven coach candidates. She chose Cindy because of her approach. “Cindy suggested that we focus on the here and now and then make my 5 to 10 year plan,” Erica said. Alicia Marie, the founder of People Biz, a coaching and training organization, said that the number one reason people decide to engage a coach is that they hit a personal development ceiling. A moment occurs when they are stuck when they realize they must change in order to be successful. “That can happen because your entire team of twelve just walked out on you, or you just sold $1 million in product and can’t fund it,” Marie said. “It can be due to major success or major issues.” Either way, the person acknowledges that they will have to grow to deal with the circumstance. You can have systems in place but what people underestimate is that people are the levers. I’ve seen people with all sorts of resources fail because they weren’t paying attention to the people. Anyone can be successful by him or herself. But can you get another person to his or her optimum level? That takes skill. Until leaders and managers can do that, they’re at a disadvantage. Companies that do that will have a huge advantage. That’s where coaching comes in. I have worked with Mark for several years and one of the key values I find in having a coach is that he both knows my vision and what I’m up to week to week. This proves invaluable when the inevitable crises emerge. In other words, not only is he available to me for one-on-one coaching to work through an issue, he also has the context to guide me through a fork in the road. This came in handy recently when a partner from my former business asked me to pursue an opportunity. Tempting as it was to take on, I didn’t want to lose the momentum I’ve driven developing the Optimize for Growth system and helping my clients implement it in their own organizations. That simple reflection helped me stay focused and make the right choice when I didn’t have the horsepower or objectivity to effectively tackle the challenge myself. Dave Marinac, the owner of ABC Packaging Direct, also works with Mark Huge to implement EOS in his organization. “Mark leads our Level 10 meetings every Monday,” Dave said. “He helps us to keep the emotion out of it. I want to jump in, as an entrepreneur, but he keeps us on point.” In addition, Dave uses him for general executive coaching. “He’s the guy I call with work issues and to bounce ideas off of him,” he shared. Coaches vary and choosing one takes forethought and due diligence. To begin, ask your mentor(s) and extended network for recommendations based on a set of criteria you have already developed (e.g., gender, background, focus, etc.). Interview each candidate by phone to gauge your comfort level and the chemistry and type of dialog that ensues. Often, the impetus for finding a coach occurs when entrepreneurs hit their personal ceiling. This may be coupled with a struggle in the business or a realization that what got you here will not get you there. 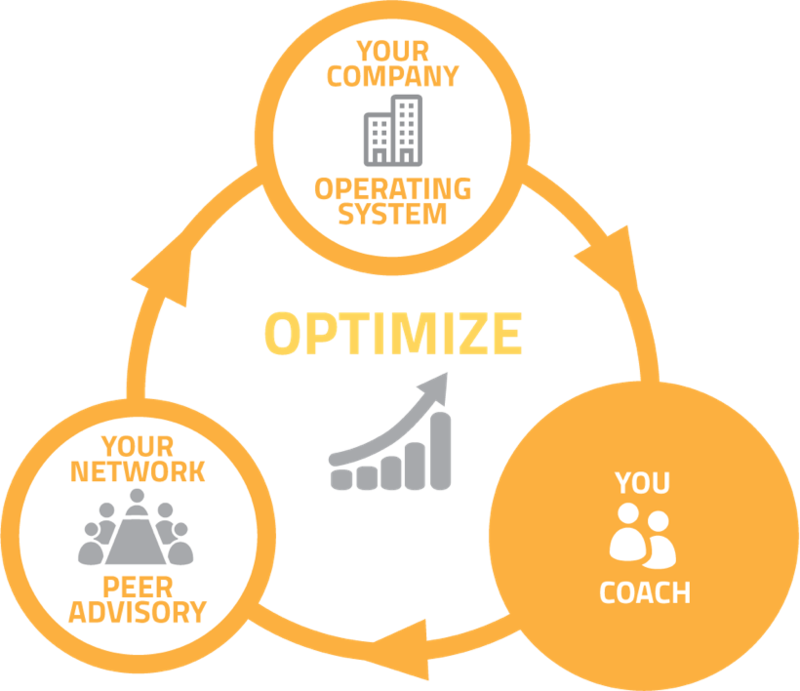 There’s another way: select a coach as part of your decision to implement the Optimize for Growth system. Your desire to scale up drove you to read this book. Now it is time to assess your top priorities for achieving growth and begin your journey on an efficient and effective path to scaling up.